Holes 1-9, Par 36, 3275 yards. Bobby's Legacy is named after the master, Robert Trent Jones, Jr. What appears to be close at hand, within easy distance, may not be as easy to achieve as it looks. The front 9 features some elusive, shorter par 4s that blend with long, tough par 4s and a par 5 with a waterfall cascading along the green to challenge all the shots in a golfer's arsenal. Beware the subtle slopes that Bobby has masterfully worked into the greens, testing your nerves on those tricky three and four foot putts. Holes 10-18, Par 36, 3645 yards. Our newest championship nine is the epitome of the scenic resort course experience. The course features more elusive, shorter par 4s that blend with longer and more difficult par 4s. Players will enjoy a blend of low lying areas near numerous wetlands, elevation changes, dramatic lake vistas and the Legacy brand of scenic holes. 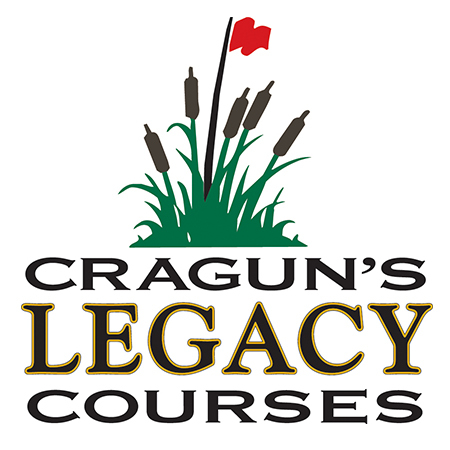 Cragun's Legacy Courses offers a large practice facility, Prolink GPS on carts, full-service clubhouse, fine dining, sports bar, locker room, pro shop, soft spikes, 5,000 sq. ft. pavilion for meetings, weddings or tournaments. Between rounds, you will find plenty to do at Cragun's Resort. There's a restaurant and bar, indoor and outdoor pools, 21,000 sq. ft. Sports Centre with tennis, basketball and exercise rooms. Jacuzzis, tennis courts, marina, meeting rooms, kids' program, Poolside Suites, Lakeview Rooms, Cottages and more. If you're looking for a great golf getaway or just a place to play golf, Cragun's Legacy Courses is the place to be.